Jeremy's Journey: Almost the last day at HT? It's great being in Cambridge already: most of my intake year will be relocating and adjusting to life here, whilst we've had 18 months to do that. But the one change I/we will have is church: I'll have an attachment parish to worship at and get to know during my training. So this Sunday may be nearly my last at our family church, http://www.htcambridge.org.uk/, before moving on. HT is an interesting place. It has a different character in and out of University termtime. At the moment, there's one morning service at 10:30 - very civilised in terms of getting up and cycling there. When term starts, we shift up to 9am, the service with children's groups, which is followed by another service aimed more at students. Who get the lie-in. 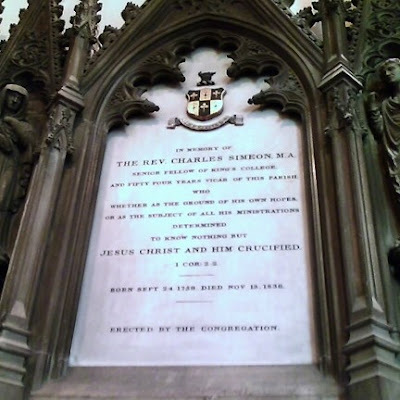 The historic incumbent of HT who is probably best-known was Charles Simeon (1759–1836), who faced (and outfaced) almost unimagineable opposition. Simeon, a contemporary and correspondent of Wilberforce, was a leading light in missionary strategy, the mission of the church to Jewish people and clergy education (these were the days before theological colleges in the Church of England). On the one hand, it would be nice not to have to face such trials; on the other, what it would be to leave such a legacy! Simeon - one of my heroes. I've got a copy of Moule's biography of him; Metheun, 1892.